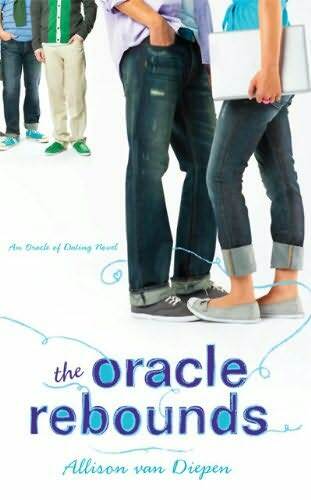 The Oracle Rebounds is the sequel of The Oracle of Dating, which I loved it. Just for the tittle I knew something was going to happen between Kayla and Jared. It was sad to see them breaking up, and Kayla trying to deal with her broken heart. But as always, I loved Kayla. She´s sweet, intelligent and strong. Even with her heart broken because of Jared, she can't hate him. She isn't going to say nasty things about him, even when she doesn't understand why he made that decision. I was angry with Jared at first, and ready to hate him. He made an awful mistake, they belong together! But it is nice to see that he's still the same sweet and caring boy. Kayla is a great role model. I don't think I would have reacted the way she did, at least at her age. She's very mature, and tries to learn from every bad thing that happens to her. Allison van Diepen wrote an awesome chick lit book, again. It was fast paced and a great and fun light reading, and even when the ending felt a little rushed, I still felt happy with it. Overall, I loved The Oracle Rebounds and I can't wait to read more about Kayla and Jared. More about this book at Goodreads, Amazon , The Book Depository, allisonvandiepen.com.